Back in May of this year, I started my experiment with creating – and baking with – a sourdough starter. Now that November is nearly with us, almost six months on, what is the starter like to live with, and what effect has its appearance in my home had on my life? In July, when I gave a ‘clone’ of my starter to my sister as a gift, I wrote her a guide to looking after her starter. My starter is less cosseted these days – it drinks tap water, and has survived several rounds of being abandoned in the fridge for a couple of weeks or longer between feedings. After long periods of abandonment, the starter has a sharp vinegary smell, and either a layer of greyish water on the surface, or an even more unattractive and worrying-looking layer of ‘fuzz’. But every time, after pouring or scraping this away, and feeding the starter, it has sprung back to life. I use less salt in my batch than I did to start with, but otherwise my method remains the same as for my very first loaf. I often bake a double quantity, and freeze one loaf. I’ve added cheese, herbs, and sun dried tomatoes to loaves, with great success. More recently, I haven’t used the stand mixer for some batches, but worked the dough entirely by hand instead. A plastic dough scraper, which I bought from eBay for 99p, is a great help and not exactly an investment that broke the bank! As you can see from the photo, I’ve baked rolls, free-formed loaves, and even a loaf in a tin. The sourdough pizza was *amazing*, too. It all works brilliantly, so the limit should only be your imagination! Several ‘clones’ of my starter are now in new homes with family and friends, and they report baking very successfully with their starters too. So you see, if my Dad can do it, so can you! There are even rumours of my starter making it into small-scale commercial production, so watch this space! As an aside – when I was growing up, I sometimes wondered about the Lord’s Prayer – specifically, the fixation with ‘daily bread’. After all, what was so exciting about bread? Well, it’s a bit like the first time you’re outdoors, on a crisp clear night somewhere really, really dark, and look up and see the infinite billions of stars and the Milky Way spread above you, and the phrase ‘majesty of the heavens’ suddenly makes sense as something other than a weak metaphor – in an earlier time, before we filled the skies with artificial light (and our larders with artificial food), these things were seriously impressive! 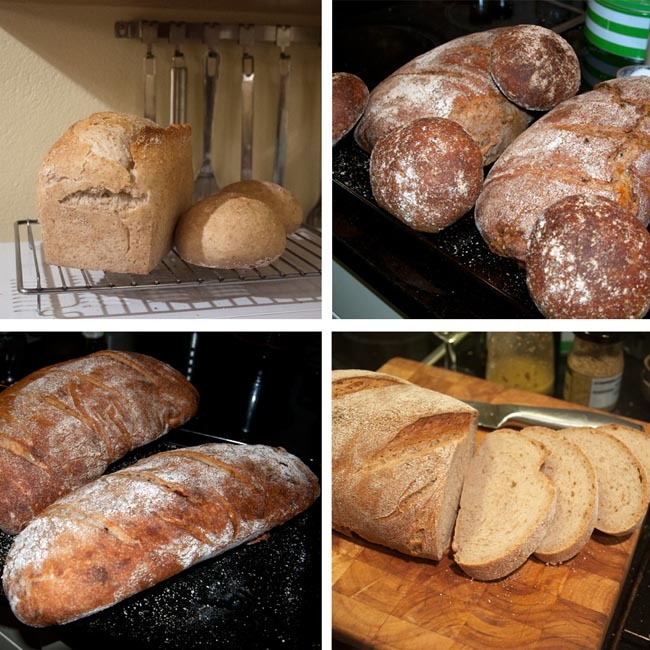 Good bread may genuinely change your world – your food world, at least! All of which means that regular baking days have become a feature of our already rather busy lives. Now, I wouldn’t have it any other way. And, yes, you’ve guessed it, today is a baking day! This entry was posted in Baking, Bread, How-to, Slow Food, Sourdough, Tested and tagged bread, country skills, food, home produce, recipe, sourdough, traditions by Kate Watson. Bookmark the permalink.